What was the fate of this Obergefreiter? Can you help me know the fate of this soldier? The whole mask and case is rests untouched. How should we as you dont even has his compkete name? You can try to find out by posting the field post number in Orders of battle and individual research forum. The name is Schütze Math. Ach, so I would bet for Mathias Ach. But the Feldpostnummer is not for the 2. Kompanie, III. Bataillon, IR 10. The 2. Kompanie of the III. Btl would have the 9th company. 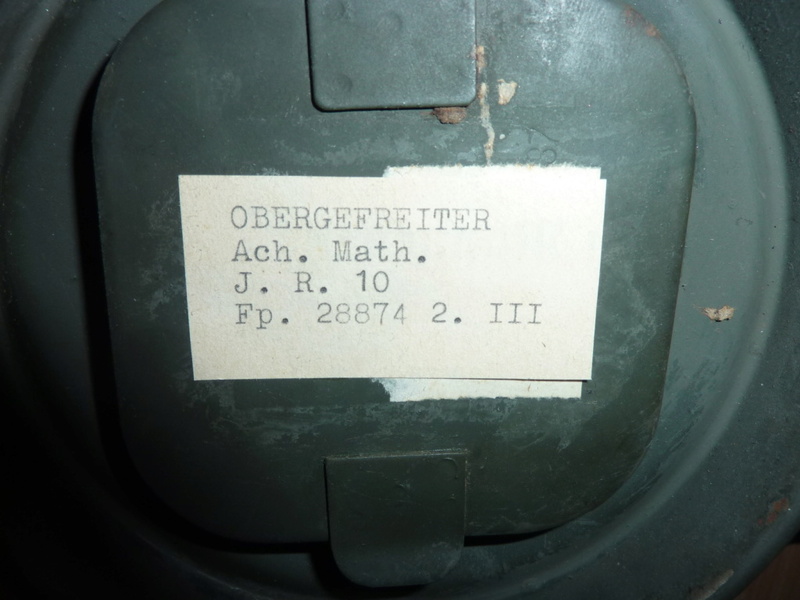 The 2./IR 10 have had the Feldpostnummer 12528 until 1940 and since then 21997 C.
The number on the can is 28874, that was the Kommando 10. Infanterie-Division. Strange label. Can you post a better pic of the label on the gas mask strap? As both names show dots, both are shortenend. 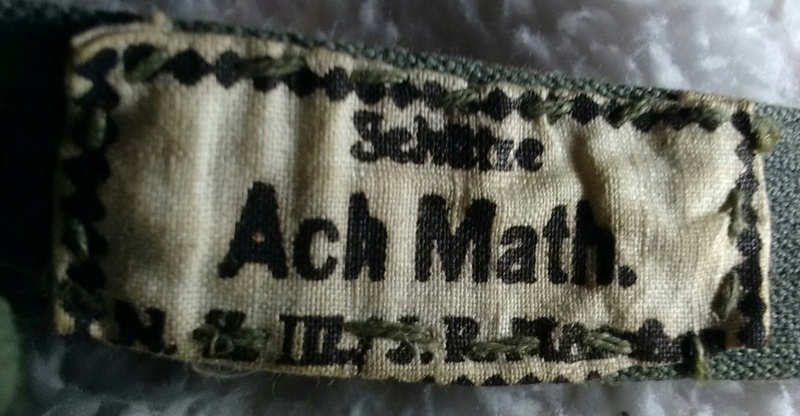 So could not be "Ach". Makes it nearly impossible to find out the complete name. Here, but the marking is a little hidden by the seam. Really not possible to know more? Like Hoover says. The Feldpostnumber does not match with the unit. From the picture the paper looks very new. Was it added after the war? I'm collecting anything related to the towns Castricum and Bakkum during WWII. 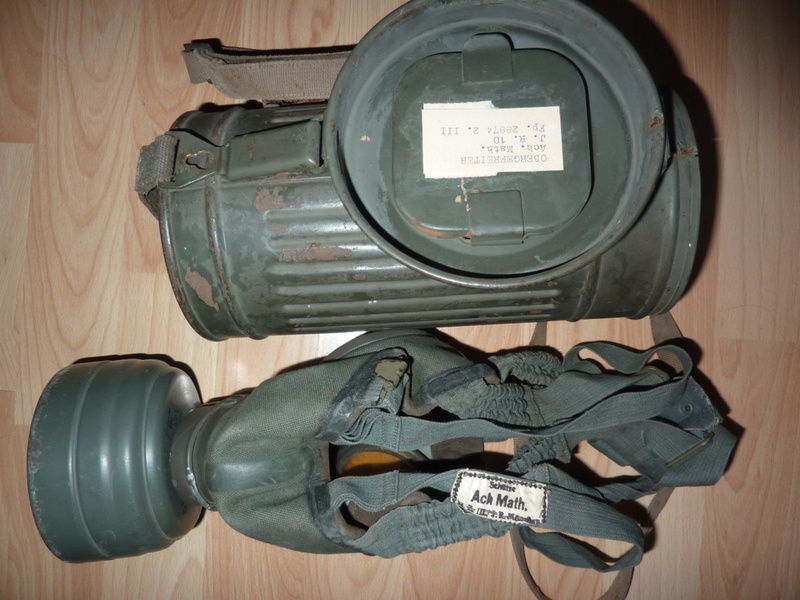 Also soldbucher from 116pzdiv. And 1944-1945 eastfront pockets, kampfgruppe and Oder front.